Getting their start in the late 80’s as a country band, Canadian sibling act The Moffatts are back after an 18 year hiatus. Releasing their major label debut in 1998 titled Chapter 1: A New Beginning, the Victoria, Canada four-piece made the full transition from country to pop with a few modest hits in Asia and Europe. Dropping their most ambitious (and last) album titled Submodalities in 2000, this release saw the disbandment of the four brothers as a musical outfit. While identical twins Clint and Bob have formed various country bands over the last decade or so (they currently perform around Nashville, TN as Endless Summer,) brothers Scott and Dave have released music at various points as well, though they have never done anything together. Once the band created a Facebook page last year, teasing a return, they officially released their new single “Secrets” earlier this year, toying with a similar sound fans heard on Submodalities. While the band always wrote soaring melodies and great ballads, the heavier songs are where they really shine. 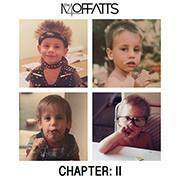 “Secrets” is the track that opens up the group’s latest EP Chapter: II, a six song EP that brings The Moffatts full circle. Tunes such as “So Good” bridge the gap between country and pop music, something that the band did well as teenagers. While they’ve thankfully dropped the country twangs that dotted their early material, the unmistakable harmonies are back, along with their flawless songwriting abilities. Ballads such as “So in Love” is the highlight of Chapter: II, as we finally get to hear brother Dave after being dormant for so long. While he did not initially join his siblings during the early stages of their comeback when they toured around Asia, we are glad he decided differently, as the band wouldn’t be the same without him. Without Dave, it’s like The Moffatts would be missing an essential ingredient, and on “So in Love” we finally hear him shine vocally. Ending with a new version of an old song titled “Love,” fans probably weren’t expecting to hear a remake of an older tune, and while it sounds largely the same as it did 20 years ago, the familiar melodies are still there, reminding fans of why they fell in love with The Moffatts in the first place. While the band still maintains a large fan base in Asia (which never wavered,) hopefully the rest of the world will remember the band and give them the recognition they’ve been waiting over two decades to receive. Watch the music video for “So In Love” below.